Olympia Reyes professional, self taught, artist was born in Gibraltar in 1945. Although she never had the opportunity to go to University Olympia’s desire to become an artist materialized through sheer hard work. Sister Presentation, her Secondary School Art Teacher, took her to A-level standard for exams. From then onwards she would learn from any and every Art book she could get her hands on. In 1983 she took a correspondence course in portrait painting with The Portrait Institute Course, Washington, Connecticut. run by John Howard Sanden & Elisabeth R. Sanden. It is through her natural ability rather than through learned techniques that she paints. She paints what she feels; it is all in her imagination; the evolution of her life. If she paints any realistic paintings she does so outdoors surrounded by nature. 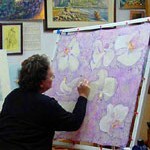 Olympia holds regular private classes, she has been teaching art for over 45 years. 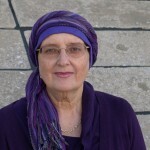 She started at the Christian Brothers Preparatory School and later lectured at the Command Education Centre and at the Technical College in Gibraltar. During the period between 1975 to 1990 she held twelve very successful one man exhibitions and from 1983 to 1993 she designed many sets of stamps for Gibraltar, twelve of which were duly accepted and reproduced by the Post Office. Over the last two years she has been taking a more spiritual approach to her work; painting with her feelings, she aims to draw from within what she has learnt about life. The hard times in her life have greatly inspired her; she expresses her positive and negative feelings through her art. Olympia is very diverse in her work; she paints in oils, pastels, acrylics and water colours as well as doing silk, glass and ceramic painting; also teaching herself to make her own jewelry. As well as all this she has found the time to learn to handle computer graphics and also to paint digitally. As a Gibraltarian artist she wants to spread love, peace and joy to the world, through her work.